US Temporarily Closes Busiest US-Mexico Border Crossing in Calif.
U.S. Customs and Border Protection temporarily shut down northbound traffic into the United States at the San Ysidro Port of Entry in California Monday due to reports that a group of Central American migrants was trying to rush the border, the agency said. Though no activity materialized, the agency said the closure at the nation's busiest border crossing was needed to install "additional port hardening materials" in preparation for the migrant caravan. "CBP officials suspended operations to safely place impediments at the port of entry that would restrict access to a large group attempting to run through the border crossing," the agency said in a statement. More than half of lanes were reopened several hours after the closure was instated. 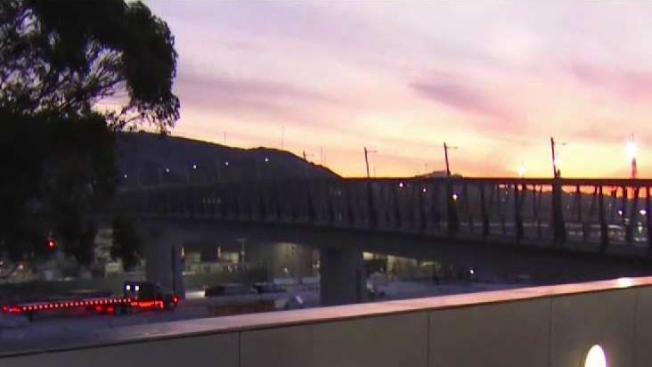 Pedestrian lanes into the U.S. at the San Ysidro Pedestrian East facility were also closed for several hours Monday before reopening for northbound traveler processing. However, lanes for foot traffic at the Pedestrian West facility crossing remained open throughout the closures, CBP said. Southbound lanes were not affected. The decision to close northbound traffic not only kept some people from getting to work, but it also kept plenty from spending money at American businesses. A Chula Vista strip mall usually flooded with shoppers from Tijuana was surprisingly empty given the time of year. This is how we survive," Santa's Toys manager Hai Trinh said. "And it's dead right now." Trinh said he's feeling the impact of the closure more than some other shops because 98 percent of his customers come from across the border. "This time of year I wouldn't be able to talk to you because it's Christmas season," Trinh told NBC 7. San Ysidro Chamber of Commerce Executive Director Jason Wells said the closure hits hardest in bi-national regions like his border city. "Most [business owners make what they're going to make all year between November and January," he said. Mexico's El Buen Fin, which can be compared to Black Friday here in the U.S., ended Monday which was also Revolution Day, a Mexican National Holiday. Store owners said they were anticipating even more business because of the holiday. The move to close the border came as hundreds of migrants traveling in the caravan arrived in towns along the U.S.-Mexico border after weeks on the road. More than 1,100 Marines have been deployed to assist CBP with Operation Secure Line, a "border hardening" mission meant to prepare the area’s infrastructure for the arrival of thousands of migrants hoping to seek asylum in the United States. CBP said the Marines' specific duties include installing barbed wire to make walls less scalable and reinforcing construction areas so that people could not cross into them. Pieces of barbed wire, concrete roadblocks and rebar are being used to create movable barriers that can be used to block lanes at the San Ysidro and Otay Mesa ports of entry. Thousands more troops from other branches of the military have also deployed to the border to assist in other ways. For example, Army Military Police are there to protect the Marines who are not armed and are prohibited from enforcing the law. The Department of Defense insisted last week that the troops were sent there to help CBP and nothing else. "My place is not to think about fiscal restraint, that’s for Congress. We’ve been asked to do a job and that’s what we’re here to do," Army Captain Guster Cunningham said. In October, President Donald Trump threatened to close the southern border to address the caravan if the situation worsened. Since the arrival of the first troops at the border, CBP has acknowledged that option is still on the table. Video shot at the U.S.-Mexico Beach Border west of the San Ysidro Port of Entry shows members of the migrant caravan climbing a fence the day after arriving in Tijuana, Mexico after journey spanning several weeks. Meanwhile, tensions on the Mexican side of the border have built as nearly 3,000 migrants from the caravan poured into Tijuana in recent days, The Associated Press reported. And with U.S. border inspectors processing only about 100 asylum claims a day at Tijuana's main crossing to San Diego, they will likely be there for months while they seek asylum in the U.S. Some Tijuana residents supported the migrants, but others accused the migrants of being messy, ungrateful and a danger to Tijuana. On Sunday, about 400 Tijuana residents took to the streets in protest, waving Mexican flags and chanting "Out! Out!" They also complained about how the caravan forced its way into Mexico, calling it an "invasion." And they voiced worries that their taxes might be spent to care for the group.